I’m starting to feel that the only thing I do on here is apologize for not posting more often. My current excuse is that the holidays were hectic. Angela’s parents came to visit for a week and then we went skiing in Vermont. But now I’m back and will hopefully be able to provide a little more attention to this food blog of mine. This meal actually occurred before our New England winter sojourn. Angela’s mother (my mother-in-law) spent a significant portion of her college experience in Spain (she’s now a Spanish teacher). Given that she hasn’t been back to Spain since, I had the bright idea that maybe I could bring a little bit of Spain to her by making something Spanish. It didn’t hurt that I had a new Spanish cookbook that I haven’t had a good opportunity to explore. While Angela’s parents were here, we finally decided to take them up on their offer to let us do what we normally do (we always respond that we don’t normally do much of anything and that it’d be boring for them). I was in desperate need of some black peppercorns, so we set out in search of the Penzey’s in Falls Church. That portion of the trip was relatively uneventful (except for being told that they are discontinuing the Sarawak peppercorns that we prefer). On our way back, we passed a 7-Eleven where we stopped to pickup a soda. Driving into the parking lot, I noticed that there was the Lebanese Butcher in the same shopping center. While not a particularly large shop, they do have a good selection of meats (but no pork) at good prices (particularly for veal). Because of the prices and the fact that we wanted something fairly simple, we settled on the veal chops. I also picked up some tahini, pomegranate molasses, and rose flower water. The last two are a bit harder to come by in western stores and have nothing to do with this recipe. This is a fairly simple recipe but I managed to mess it up a bit when I made it. After you brown the veal, liquid is added and it’s cooked at a low temperature for 10 to 15 minutes (simply 15 minutes in the original recipe). Unfortunately, different stoves have different settings for low. When we were in California, low meant turning the knob just lower than medium (anything lower and it wouldn’t cook at all). Here in Virginia, low is turning the knob to almost off. While I prefer this stove to the California stove, it meant that I overcooked the veal. It wasn’t bad, just not quite where I’d like. So be careful about what temperature it’s cooked at. 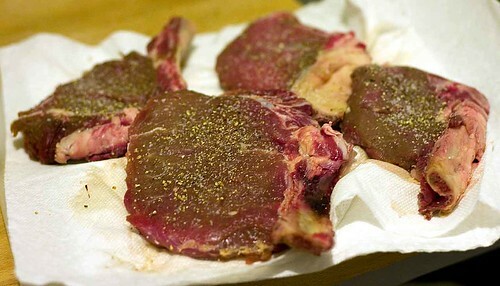 Season the veal chops with salt and pepper. 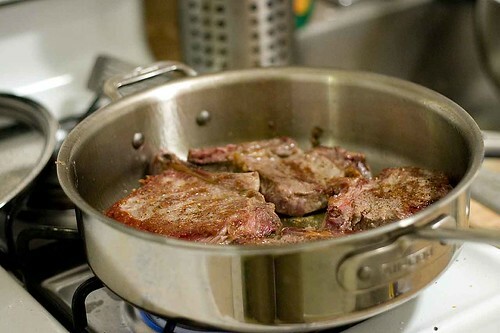 Heat the oil in a large skillet over high heat. When the oil is hot, brown the chops on both sides. Add the garlic, salt, pepper, paprika, vinegar, and broth and lower the heat to low. 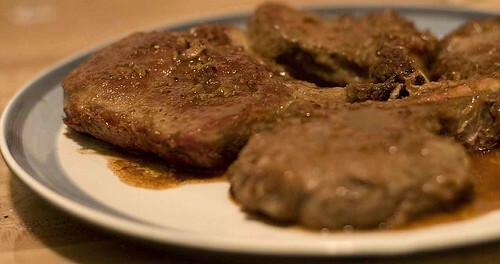 Cook for 10 to 15 minutes, or until the veal chops are cooked to the desired doneness. Serve immediately with roast potatoes.